← Happy Release Day to Alli Sinclair for LUNA TANGO! I had visions of being captured on video and going viral on YouTube. ‘No, no way.’ I shook my head vigorously. I ran a hand over my head. No way could I sing in public, especially after my dance incident. Singing was a completely different thing, and my voice could barely crank out a simple Twinkle Twinkle Little Star in tune. ‘If he says yes, you have to play Twister with him, but if he says no, well, I guess there’s nothing you can do about that. But you have to at least ask him.’ She shoved the phone into my hand and it shook in my grasp. It was only a simple phone call, but something about being around him made me nervous. Maybe it was his superhuman physique, or the fact that he seemed like some super-caring, kind, too-good-to-be-true angel from heaven sent down to earth to make women swoon and look after those who needed a little extra support. He came from a completely different world to mine, and it felt like I was about to call my teenage celebrity crush. ‘Here’s his number,’ Lorena said, showing me her phone. I added him as a contact and my finger hovered over his number. ‘Press it, Sally! I want to see this!’ Red was back to her usual self at the prospect of another embarrassing moment for me. ‘Hello? Ty speaking,’ he answered. I cleared my throat but my voice remained croaky. ‘I was wondering if you’d care for a game of…’ I cleared my throat again at the same time as uttering the word, ‘Twister’. ‘Twister,’ I said more loudly, the painful embarrassment like a red-hot burn on my cheeks. Mel tipped her head back with a sudden laugh. ‘The guest house. Ten minutes. I’ll warm up on the way there.’ And then he hung up. I kept the phone next to my ear and furrowed my brow, my mouth agape. ‘He hung up on you?’ Georgie asked. ‘And I’m definitely out of this game,’ Lorena said, holding her belly and convenient excuse. I was sure, though, had she not been pregnant, she wouldn’t have minded playing Twister with a stripper. ‘And as much as I’d love to get up close and personal with His Royal Hotness, I’d much rather see you in action on those coloured spots.’ Mel grinned, and I looked towards Georgie for moral support. ‘Too late for an appeal, Sal, you better get ready. Warm up and stretch or something. I’ll set up the mat. Tick-tock!’ She tapped her watch. Oh my goodness gracious me. I felt like I was about to betray Greg. What had I got myself into? As Mel prepared the game, I swung my arms around in circles. Probably best if I did warm up a little, it would make it easier to manoeuvre around the mat and avoid bodily contact. Why did he agree to play Twister anyway? He knows I’m taken, so it’s not like he’s seeing it as an opportunity to hit on me or anything. Probably just wants to show off his…bendiness. 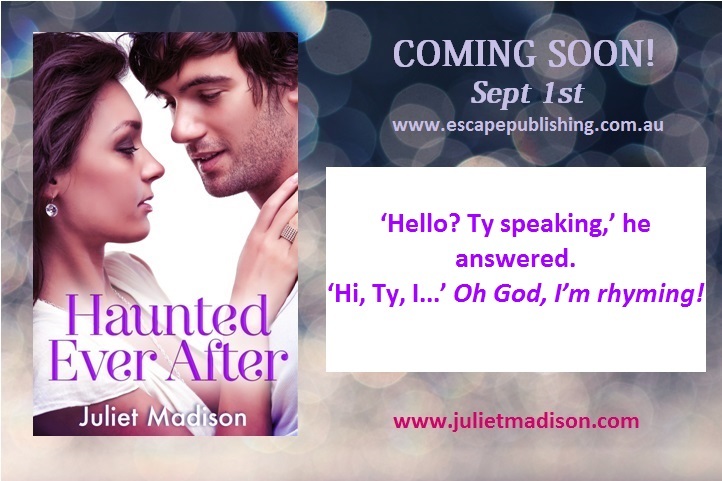 Posted on August 4, 2014, in Books, Excerpts and tagged excerpt, excerpt pic, excerpts, haunted ever after, quote, quote pic, romagic comedy, romantic comedy. Bookmark the permalink. Leave a comment.